Noah has come a long way from the little baby who would fall asleep in his infant carrier if left unstimulated for more than 5 minutes. At 10, Noah has no trouble staying up with his 6 siblings still at home; he fits right in with his church friends and neighbors, and he absolutely hates anything that even resembles resting except at night. Our family has been undergoing some changes as my Etsy embroidery business is coming into its own, and we are shifting from relying on corporate America to sustain us financially to exploring more local opportunities and flexing our own entrepreneurial muscle with several family businesses. Andrew’s expertise is keeping him in business development with an eye towards entering the field of property management in the Austin/Dripping Springs/Wimberley area, and I (Alyson) have my machine embroidery business over at http://www.21reasons.etsy.com. Leah (15) has been learning everything there is to know about essential oils in hopes of developing a product line of functional essential oil products. She is also entering into the field of pyrography, which combines her artistic ability with an application in wood burning. More to come on that! Andres (13) has started his own lawn care business specializing in mowing and weed-eating. He went from having to borrowing his dad’s mower to acquiring his own and then adding a leaf blower and weed-eater all within a few weeks. Eden (12) is our resident animal expert. She is quite the animal rescuer, nursing every little thing that comes along back to health against all odds. She does the impossible. Think you have to have an incubator that automatically rotates eggs to hatch chicks? Apparently you don’t; well, at least Eden doesn’t. Her latest feat was hatching several eggs that had been abandoned by their mother hen, and all she had was an old heat lamp and a plastic bin. She has a thriving egg business here in Wimberley, Texas. That brings us to Noah (10). Noah’s been watching with great interest all the money that the kids have been earning (and spending). THE STORY: Visiting with a dear friend one afternoon, she shared with me how much her father, who has advanced Parkinson’s disease, enjoyed this fantastic reversible sequin pillow that he could run his hand back and forth over to change the sequin colors. A color fanatic myself, I was totally intrigued and set out to find one of these pillows for my son, Noah, aged 10 with Down syndrome. After searching high and low I came across one in a retail establishment for $30. I snatched it up, brought it home, and Noah LOVED it! Well, so did his siblings, all 6 of them! It wasn’t long before other people we knew started coming to mind as needing to have one of these pillow. Using my contacts in the embroidery business, I came up with higher-quality zippered reversible sequin pillows that I could assemble for $20 a piece before embroidery – 33% less than what our first pillow cost us. We passed one of our completed pillows along to a neighbor with severe autism who is usually nonverbal. After we showed him what it did and gave him time to process the information, we were surprised to hear him say Gracias. He spent the next two hours tracing patterns in the pillow and now keeps it by his side. We’re delighted!!!! As I started putting the pillowcases and pillows together that we were gifting to our friends, I realized this was work that Noah could do, with some help. That’s how Noah’s Mermaid Pillows were born. THE PROCESS: The pillow covers are manufactured, and I add an embroidered name to the back if requested. Then the components are assembled, bagged and labeled for shipping. For the pillows Noah assembles, he takes the pillow cover, unzips it, inserts the pillow (which, believe it or not, takes some serious coordination to do all the pulling and tugging and stuffing), and zips up the cover. For every pillow Noah stuffs (starting at 5 a week), he receives $5 – $1 for spending money, and $4 to go towards the speech therapy and therapeutic horse riding at http://www.RedArena.org that helps to keep him at his best. Our hope is that we could give back to Red Arena and allow the scholarships they have so graciously gifted to us to be passed on to another child. Noah will participate in some way in every single Noah’s Mermaid Pillow order. Every packing slip will be hand-signed by him; he’ll also be helping in the packing and shipping department. This will introduce him to processes and procedures necessary in business with an eye towards meaningful employment or a greater role in http://www.21reasons.etsy.com in the future. On our first pillow-assembling session, Noah stuffed 6 pillows, and our work time quickly turned into a speech therapy/occupational therapy session (with awesome cooperation from Noah). We practiced talking about everything we were doing; zip, open, push, pull, etc. We also practiced our colors as each pillow had two colors depending on which way you swiped it. As soon as we get our first order, Noah will practice counting money, fulfilling orders, printing and placing address labels, signing orders, etc. And I’m thinking he’ll be adding a special sticker to each mailout as well – we are still trying to capture each occupational therapy opportunity possible. Noah will also be going to local businesses that have waiting rooms, introducing himself, and with some help, asking for an opportunity to leave a pillow as a gift and for advertising purposes. Are ya catching our vision? Let me know, because I have some ideas on how you can help. Just leave me a note in the comment sections and I’ll get back to you! For those wishing to purchase one of Noah’s Mermaid Sequin Pillows, follow the link . . . 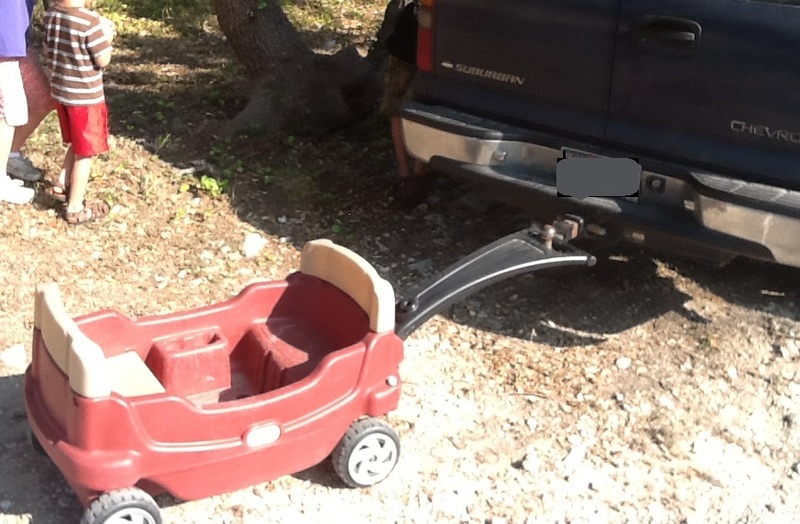 Note the handle of the wagon has actually been placed over the hitch. Can you imagine what would have happened if nobody had walked behind the Suburban? Can you say country bumpkins? So, who would you guess is responsible for this little doozy? I’ll give you two hints. 1. He’s my out-of-the-box thinker. Come to think of it, he blew up “the box” ages ago. 2. He’s got a smile that takes me to the moon and back. Oh, how I love that courageous hero of mine! Well, the Dunn Family Homeschool officially starts the new school year tomorrow. The kids are spending most of Monday at our church’s weekly Bible class, but will I let that stop me from having our first day of school? Never, I say with an evil cackle. I start this school year like I have so many others – high hopes, high expectations, a ton of curriculum (although not as much as in years past – my shelves are full of very good but unused curriculum). I’ll be teaching four age groups this year – Seth 4 and Noah 7 (DS) will be doing preschool, Bella 6 will be doing first grade and some preschool with us, Andres and Eden will do 5th grade, and Leah will be doing 7th grade. Uh-huh. Or maybe more accurately I should say Uh-oh. I’m going to go back to basing my preschool curriculum around the alphabet, one letter at a time. Let’s see if I can get past C this year. Math will be Math-U-See, Language Arts-Abeka, 7th grade science – Abeka, History – Alpha Omega LifePacs, Bible – Character Sketches by Institute in Basic Youth Conflicts (ATI) (and yes, I know about Bill Gothard’s fall from grace) :(, and we’ll be capturing teachable moments along the way to fill in all the gaps. I realize how less than fully present I’ve in homeschooling the kiddos the last year or so, and I want so much more this year. I want to get caught up in the excitement of home education again, I want to find and capture the ah-hah moments my children and I have along the way, I want to treasure each and every teachable moment, each and every time of togetherness. Lord, let it be so! Disclaimer: When I first started reading blogs, be it mothering a large family, homeschooling or parenting a child with Down syndrome, I hated it when the authors lamented over their doubts, shortcomings and weaknesses. If I wanted to read about those, I could just start a journal. Yet here I am, full of doubts, shortcomings and weaknesses; and here I sit sharing them all with you. It seems less than honest to do anything else. The children are all on grade level it seems, except Noah. I find myself elated and dejected at the same time by all he has accomplished this year. He has started using spoken two-word phrases; he can, ever so crazily, write his name, he is able to do speech flashcards along with me and by the third repetition he can say the word on his own most of the time. Those are all big differences between last year and this, and that’s the elating part. The dejected part is that we have been working on many of these things for 3-4 years. I think of ALL the time, effort, frustration and creativity that has gone into it, and I am flustered and overwhelmed by how slowly we have progressed. And then there is the ever maddening question of would he have done better if he had been in the public school system. A few of the things Noah has been up to during my blog hiatus? He’s learned lots of potty words that we wish he hadn’t. He has taken to calling certain people stinky and yucky. It’s hard not to laugh when I leave him with a therapist or other adult and when I come back, they bubbily tell me, “He kept saying something, but I couldn’t tell what it was.” And then I have to break it to them that he was calling them one of the two. Maybe I should just shrug my shoulders next time and tell them I have no idea what he was saying. Noah has gotten to be resistant during drilling, and I often have to bribe him with the promise of iPad time or a goodie. Noah spent a week at a horse day camp at Red Arena with three of his siblings. Much fun was had by all! Most of Noah’s noises are still unintelligible – I don’t think he is even trying to pronounce a word most of the time. He uses simple signs and sometimes even speech spontaneously – still mostly one-word phrases. 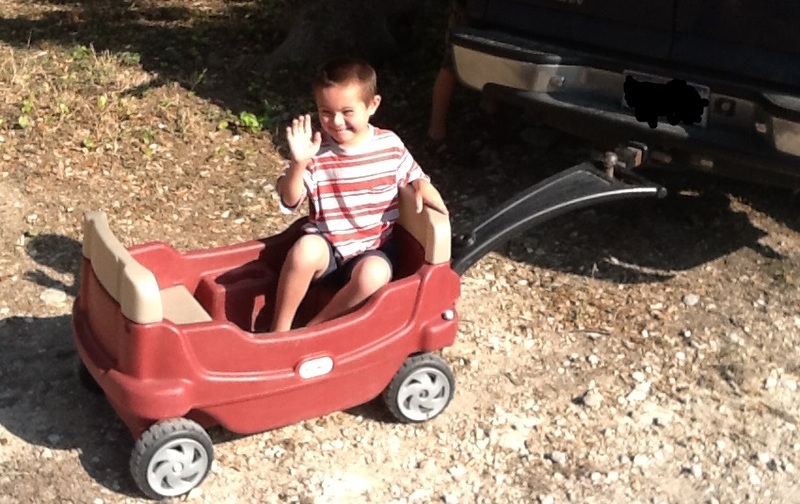 Noah responds very well to PROMPT speech therapy, and we are seeing some carry over at home. He says words much more easily if I say them along with him. Having him place his pointer finger on my lips while I say a word also helps him a lot in his pronunciation. This road is much longer and steeper than I had imagined it would be, but the scenery is beautiful and the company is the best. Noah fills our life with love and affection and it is a blessing to know and love him. Blessings to all for a great school year. Stay tuned for our adventures through homeschooling and Down syndrome? Don't let the textbooks fool ya; little boys with Down syndrome are VERY clever!!!! While I was sleeping . . .
Upside Down – Just the Way He Likes It!